Available in any page size up to 12" x 12"
Wall calendar printing is one of the few ways you can guarantee people are in contact with your brand all year long. Few advertisements in any format can make the same claim. For this reason, custom wall calendars are extremely popular as promotional giveaways, especially during the holidays. For small businesses, the multiple pages offer a variety of promotional opportunities. You can feature different products for each month, or add cut-out coupons good for limited-time offers, such as during specific holidays. The large 32-page format and photo-quality printing also offer easier reading and viewing. Large wall calendars are excellent for planning while keeping your brand at the forefront of both employees and visitors for the entire year. Teachers and other professionals with tight schedules can use a big wall calendar to keep track of scheduled timelines at a glance. Wall calendars are available in sizes as large as 12" x 12". Traditional saddle-stitch binding with staples and wire-o binding is available. Choose wire-o binding if you want calendar pages to be easily detachable without tearing. Wall calendar printing is easy. Simply download free calendar templates to take the guesswork out of creating accurate monthly or yearly calendars. Our online design tool makes it even easier, letting you create wall calendars fit for any application. 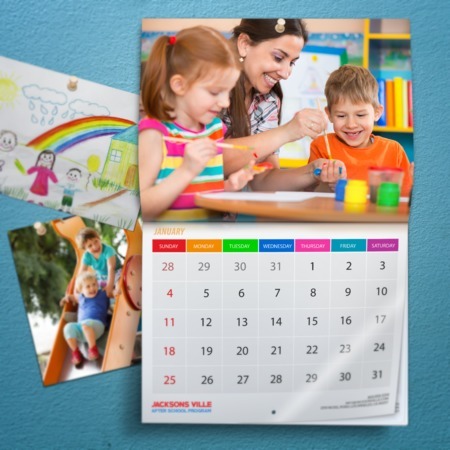 Wall calendars can be printed in 1 business day if you’re in a rush. Calendars allow your to record your daily activities and schedule your plans. If you have a business, however, calendars can be used to gain exposure.